The most famous film set on the Gulf Coast of Florida is Citizen Kane. The Orson Welles masterpiece many, including the AFI, consider the greatest American film of all time. And while Citizen Kane was actually shot in Southern California and on Long Island, there are plenty of other films shot on the other west coast—in Florida. And since I took the above photo on St. Pete Beach last weekend I thought I’d focus on a few films shot in the greater Tampa Bay area. Just a couple of miles north of where I took that photo on Pass-A-Grille sits the historic Loews Don CeSar Beach Resort where just last month The Infiltrator (starring Brian Cranston) shot some scenes. The same place Robert Altman shot part of HealtH (1980). Director Ron Howard shot Cocoon (1985) in and around St. Petersburg, Florida. Steven Soderbergh shot part of Magic Mike (2012) on Treasure Island—starring Channing Tatum who graduated from high school in Tampa. Harmony Korine shot Spring Breakers in several locations in the area. The pastel neighborhood featured in Edward Scissorhands, starring Johnny Depp, was shot a few miles north of Tampa in Lutz, Florida. Dolphin Tale starring Morgan Freeman was primarily in and around Clearwater, Florida and Oceans 11 spent a couple of days shooting at the Derby Lane Greyhound Track in St. Petersburg. I’m sure there is a much longer list, but those are some of the higher profile productions and/or production people connected with projects shot in the area. If you’re interested in shooting there contact the St. Petersburg/Clearwater Film Commission and/or the Tampa Hillsborough Film and Digital Media Commission. This is a fitting place to mention that in 2007 screenwriter (and St. Pete Beach resident) Mike France (Cliffhanger, Hulk) bought the historic Beach Theatre on St. Pete Beach. It was probably more of a romantic and nostalgic choice than a profit-making business decision and the theatre closed a few months before he died in 2013. But Kudos to France for keeping the art deco theatre—which first opened in 1940—alive a few more years. And for what it’s worth, I was doing a little research last weekend for a new script I’m writing and on the same day I took that sunset shot I caught the sunrise at Melbourne Beach on Florida’s east coast. Melbourne Beach is where Jim Jarmusch shot part of his classic indie film Stranger Than Paradise (1984)— A must see black and white film shot using only master shots. P.S. Congrats to the Tampa Bay Lightning for their victory last night against the New York Rangers to advance to the 2015 Stanley Cup Playoffs. 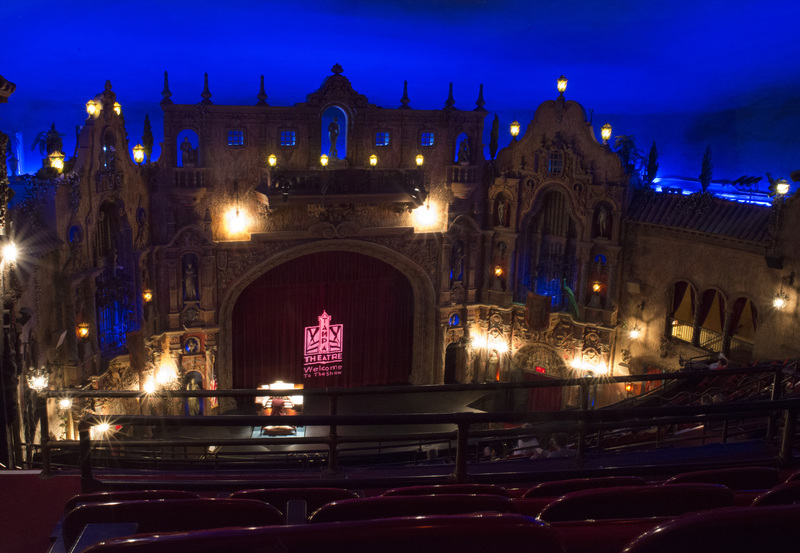 Over the weekend I was finally able to see a movie at the Tampa Theatre (in downtown Tampa, Florida) which is one of the most beautiful settings to watch a movie in the United States—maybe in the world. I say finally because the theater was built in 1926, and while I’m not quite that old—it had been on my to-do list for well over a decade. I arrived early because I wanted to look around and was not disappointed. Keep in mind that it was built in the era long before the internet, television, and even before the Great Depression. So this is a grand and ornate building complete with peacock statues, gargoyles, and twinkling stars. And I had the great thrill of hearing their Wurlitzer organ not only being played live before the movie started, but the organ and the organist unexpectedly coming up out of the grand on a moving platform. Before the movie even started I had my money’s worth of entertainment. Keep in mind that back when the theater first opened that movies were the main form of entertainment, so every week as the Tampa Theatre website points out, “more than 90 million Americans were going to the movies every week.” If you’d ever like to be transported back in time to connect to early cinematic history the Tampa Theatre is the ideal place to go. In fact if you live in the greater Tampa Bay area—or will be visiting the area in the coming months—you have the opportunity to see The Wizard of Oz (June 7), Key Largo (June 14), Back to the Future (July 5) and/or a contemporary art house film in grand style. 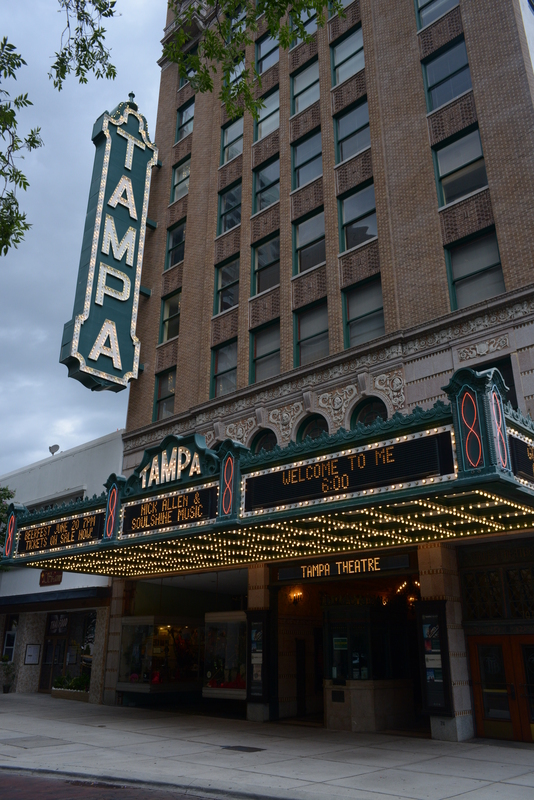 Here’s what the outside of the Tampa Theatre looks like. Eat at the Columbia Restaurant in Ybor City, drive along Bayshore Boulevard and explore the Hyde Park Village area full of craftsman homes and a small shopping area. Saint Petersburg which used to be the shuffleboard capital of Florida is turning into the Austin of Florida—hipster heaven. And why not, writer Jack Kerouac (On the Road) not only lived there for a spell, but died there in 1969. 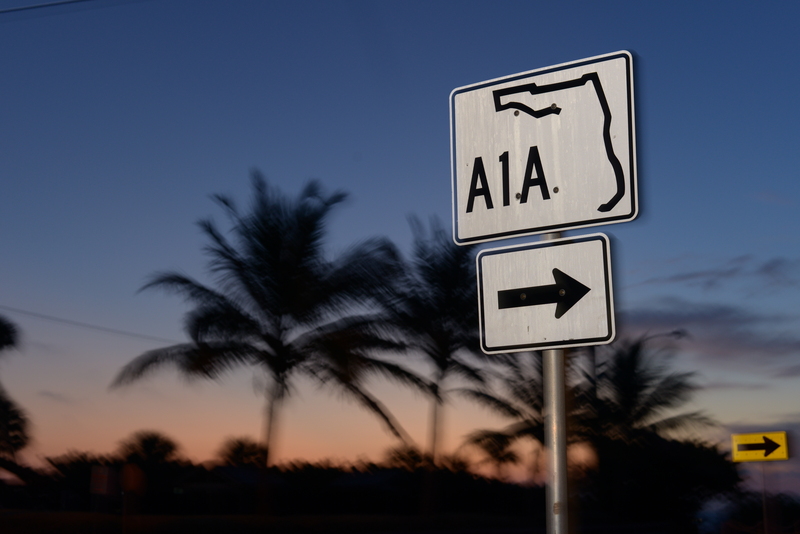 You can go sailing in the morning, visit the Dali Museum in the afternoon, get a tattoo, and catch the sunset in St. Pete Beach while eating at Hurricane Seafood Restaurant on Pass-A-Grille. And, lastly I should mention, if the Tampa Bay Lighting win tonight they will be in the Stanley Cup Final. So you could always fit that into your schedule if you can get tickets. Yesterday I visited the Bay Pines National Cemetery in St. Petersburg, Florida. My father was a pilot in the Air Force and while he did not die in combat I made a trip to the cemetery where he is buried on Sunday. I had not been there in over a decade and this Memorial Day weekend seemed a fitting time to make the trip. 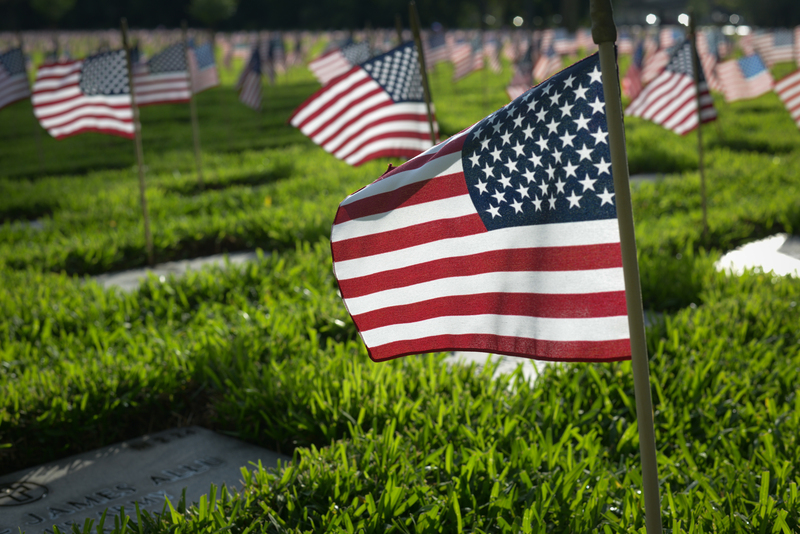 I planned my visit hoping to take advantage of the soft late afternoon light for photography, but had not planned on the estimated thousands of American flags placed throughout the military cemetery. It’s hard not to have your emotions stirred at the sight in person— I tried to capture it in this photograph. Many thanks to those who planned and executed the beautiful and symbolic tribute. And, of course, many thanks those men and women who died serving in the United States armed forces. Yesterday was one of the saddest yet sweetest days of my life. 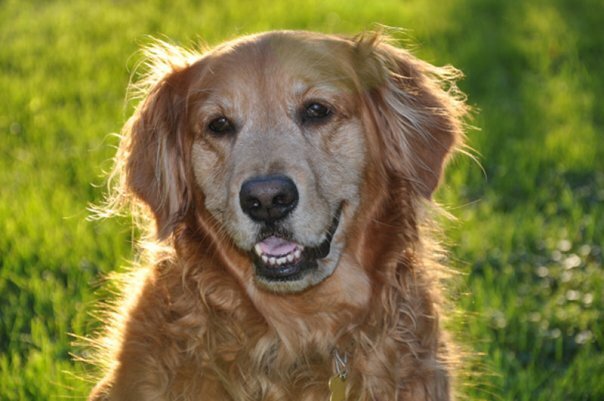 Had to say goodbye to our 15-year-old golden retriever Lucy. Can’t remember when I’ve cried so hard. But also very thankful to have her in our life for so long. Back in January 2000 my wife and I weren’t looking for a dog when we were driving home one day and saw a simple hand-painted sign that I think is the most effective advertising line ever written: “Golden Retriever Puppies 4 Sale.” We stopped and our hearts were captivated by this one dog that was hiding in the bushes. So today’s postcard comes from not being on the road, but close to home. Actually in our backyard a few years ago when we lived in Iowa. 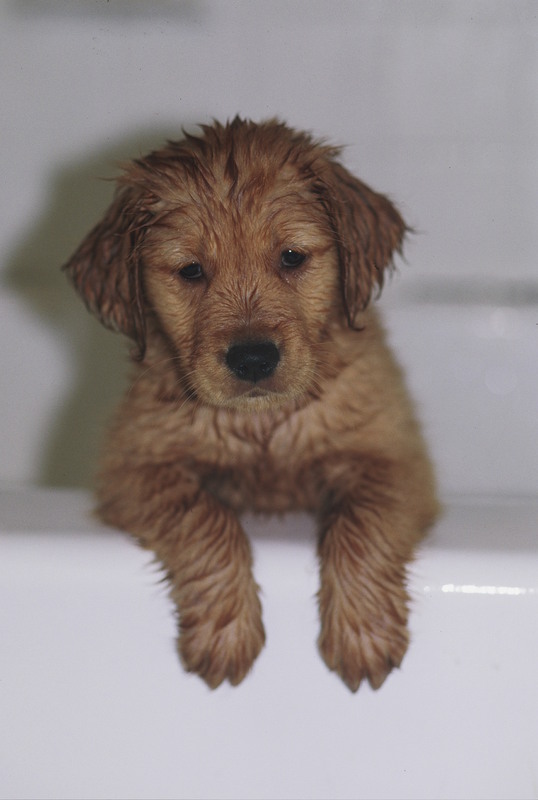 It’s my favorite photo of Lucy, followed closely the photo below soon after we brought her into our life. Since my last post (Bob Dylan & Your Filmmaking Career) was a mixture of music, filmmaking, and being from places far outside the Hollywood system I thought I’d point out a great example of someone from Scotland who’s making a great go of it recently. That went well enough that Maclean and Fassbender made a second short film, Pitch Black Heist, which won a BAFTA award. P.S. Since Maclean mentioned Bresson it trigger a memory that I think it was either an interview with screenwriter Paul Schrader (Taxi Driver) or in his book Transcendental Style in Film where he mentioned watching Bresson’s Diary of a Country Priest once a year. It’s not only where you’re from that gives you a unique voice, but the kinds of movies you ingest. And if you succeed that road may take you to the larger production hubs of Los Angeles or New York City, but I’m really interested inspiring people anywhere in the world in telling their stories. As I’ve said before, that could be a filmmaker in West Des Moines, West Africa or someone just east of the Hollywood sign in West Covina. I love reading blogs & books, and listening to podcasts, from those on the inside of Hollywood. There are many great insights from those people and over the years I’ve tried to find the most helpful ones and pass them on here. Burns’ TV program Public Morals is scheduled to debut Aug 25 on TNT. The executive producer is Steven Spielberg (can’t get much more inside Hollywood than that) and has been a dream project that Burns has had for at least 20 years. It takes a little time sometimes—even if your first film cleans up at Sundance as Burns did with The Brothers McMullen back in 1995. Dylan spent most of his youth in the mining town of Hibbing in northern Minnesota. A group of close-knit Jewish people from Eastern Europe drawn to opportunities in the area known as the Mesabi Iron Range. (See David Mamet’s connection to storytelling and Eastern European Jews.) The ore from the area once made the small town of Hibbing very wealthy. But by the time Dylan (then known as Robert /Bobby Zimmerman) was a teenager in the 1950s the mining town’s heyday was over. But it was fertile ground to listen to blues and country on the radio and learn to play the piano and guitar. Dylan graduated from Hibbing High School in 1959. If you just happen to be in the mood for Christmas music today, check out The Fitzgerald Family Christmas Album largely featuring the music of long-time Burns collaborator P.T. Walkley. P.P.S. Yes, that is the talented Connie Britton (Friday Night Lights, American Crime Story) in the screen grab above. She fit in time between shooting the Nashville TV series for the small (but wonderful performance) in Fitzmas as nod/thank you to Burns for casting her in her debut movie The Brothers McMullen (1995). Merry Christmas (2012) Same year as Fitzmas release and my last Christmas in Iowa.